In our business, we see space as an entity where productivity takes place. Everything we design and create is meant to meet your needs and, at the same time, create an efficient workspace where people are motivated to produce quality outcomes. As you probably know, desks, dividers and office chairs steal the show in the typical office set-up. 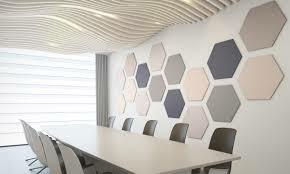 But there are small touches that can add a significant amount of value to your workspace and meeting rooms. Tack boards are one of those details. Imagine the typical meeting in your office, or any office for that matter. What typically happens is your colleagues and you take your seats, flip open your laptop or notebook and start taking notes and suggesting ideas at the appropriate time. This traditional scene, in a certain sense, creates collaboration. Ideas are thrown around, topics are debated and decisions are made. But remember, this type of meeting only caters to extroverts and those with enough confidence to speak up. Other team members might have great ideas but never voice them because more aggressive personalities take over. Tack boards allow this discussion process to take a more democratic turn. Ideas can be written down and tacked up on the wall for all to see. This method of idea generation gets results – everyone is writing down ideas – while allowing for more introverted employees to share their perspectives through writing. Another aspect here that benefits perceived productivity is that the ideas your team creates are visible. You can see them pinned up on tack boards. This has a couple of benefits. We just mentioned that the sense of productivity goes up, which is important. Even if your meeting is making slow progress, ideas and initiatives fixed to tack boards give visual markers that communicate something is happening. Aside from that, tack boards can save people who have to step out of a meeting for a phone call or become distracted. Once their call is over or they conclude their mind wander, they simply look to the tack board to understand what was discussed. Let’s add another dimension to the visual nature of tack boards: style. Meeting rooms, as you’ve probably noticed, don’t put a premium on looks. Most likely you’ve got a decent table, several chairs and a conference-call station somewhere in the room. And that’s it. From the outside, your conference room looks like a bland, Spartan space. “Bland” rarely inspires the kind of creativity and critical thinking you need out of your meetings. When you add tack boards to the mix, you open up dozens of design possibilities. Just take a look at our tack board page. We aren’t the only ones in the office business offering tack boards, but we definitely take pride in the options you have for color, shapes and sizes. You won’t be limited to bland, square tack boards that only come in uninspiring brown hues. OBEX lets you choose between 20 different colors and 10 different shapes. To get an idea of what kinds of shape and color combinations are possible for your meeting room, click here to download our tack board brochure. It features six different examples and includes all 20 colors and 10 shapes. We did a little research to find out how other companies are using/talking about tack boards. The HT Group, a human capital company based in Austin, Texas, ran a great article about the importance of creating office spaces optimized for getting things done. Among their suggestions is implementing tack boards along with high-top tables and write-on surfaces in order to spur productive planning and brainstorming sessions. We think this is a great insight based on what we know about today’s office trends. The new workforce desires an open, collaborative space where interactions happen easily. Tack boards play a part in fostering a collaborative environment. We also read an Inc. article about improving company break rooms. There are plenty of good suggestions in here, one of which is boosting the break room’s decorations. Vibrant, visual spaces promote conversation and creativity. Part of that equation includes tack boards, which serve the dual purpose of adding flare to otherwise monotonous walls and providing a surface for the expression of ideas. Remember how we said tack boards are part of the new movement toward a collaborative work space? That’s an important point, because it means adding them to your meeting room or break room takes on a new meaning that may not have been around 10 or 20 years ago. So take a second to rejuvenate your preconceptions about tack boards. Stop by the page we created for them and try and visualize what they’d look like in your workspace. Then, contact us and we will help you put your vision into practice.